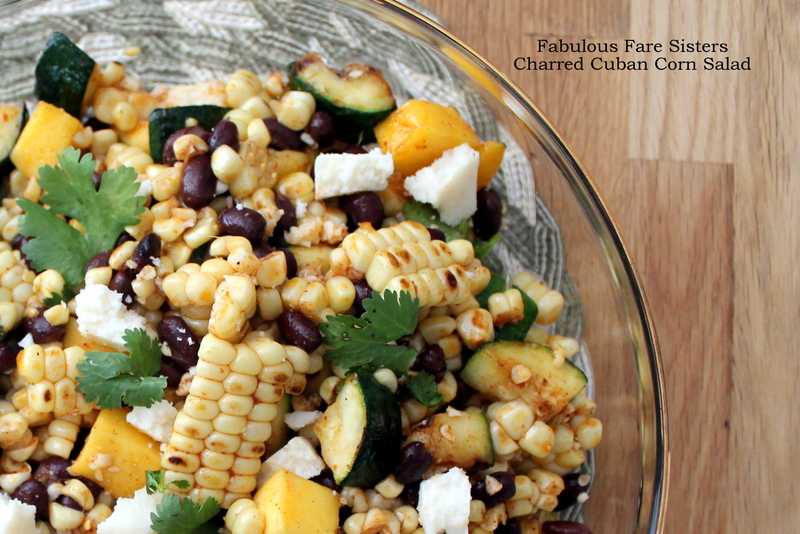 On today’s menu is another delicious summer salad – crisp corn on the cob charred to perfection and mixed with a flavor combination that can’t be beat – fresh diced zucchini, black beans and the sweet tang of mango! Drizzled with a spicy vinaigrette then topped with cilantro and Cotija cheese. Oh my goodness!! Gather your ingredients. Shuck the corn and remove the silk. Bring a saucepot of water to boil. Place the corn on the cob in the boiling water, put the lid on and cook for 3-4 minutes. Chop the zucchini into bite-sized pieces. Heat a grill pan that has been sprayed with cooking spray. Remove the corn from the boiling water and place on hot grill along with the zucchini. Grill 8-10 minutes until nicely charred. Remove from grill pan; slice the corn off of the cob and set aside. Place zucchini in a large bowl. Slice the mango into bite-sized pieces and add to the bowl. Add the black beans, cilantro and crumbled cotija. Finally add the charred corn. In a small jar combine the olive oil, salt, chili powder, paprika and lime juice. Shake vigorously. Pour over the Charred Corn Salad. Toss gently. 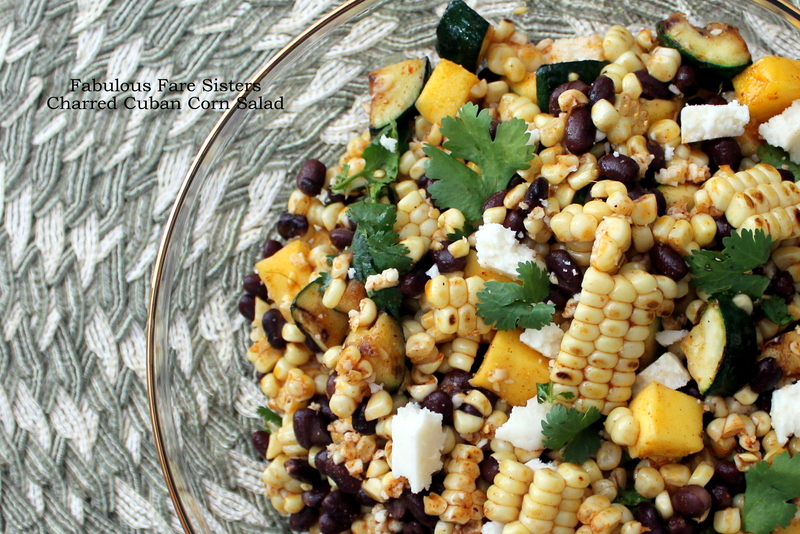 Place Charred Cuban Corn Salad in a large serving bowl; add additional fresh cilantro and crumbled cotija for garnish. Squeeze a few lime wedges over entire salad. Serve immediately or chill for later. This recipe has been shared on Senior Salon, Throwback Thursday, Foodie FriDIY, Funtastic Friday, Fiesta Friday, Saucy Saturday and The Pin Junkie…go check it out and then go visit some other great sites! This is a great salad to accompany grilled meat or to bring to a summer potluck! Love the idea of this! Simple and flavorful! Grilled corn is synonymous with summer. Your charred cuban corn looks perfect for a summer meal! Thanks for sharing it here at the Fiesta Friday! Superb way to showcase all the summer produce in season. Love the mango, lime and cilantro addition. Bet peach or nectarine would also rock. Oh for yumminess! Looks so delish! 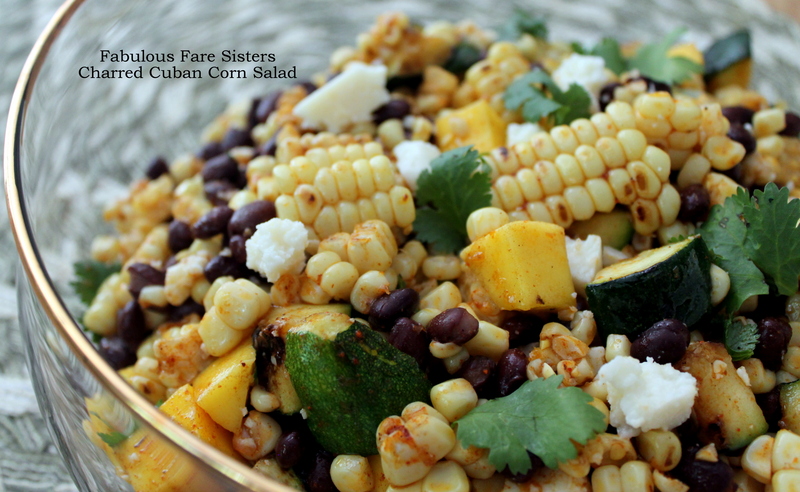 Wow you sisters have been coming up with some fabulous summer corn dishes, thanks! So pretty and fresh. Thx for sharing and reminding me to cook with corn while it’s still in season. Must try this! Linda what an amazing use of corn. Such a summer staple. Thanks for sharing. Can’t wait to try this. I can see it becoming mine too. Linda, I love all the flavors in the summer salad! Yum! Wow, what a great use of corn Linda…..it looks delicious! Just perfect for this time of year! I love corn salad in the summer!